The first 12 Portas Towns – how have they changed two years on? 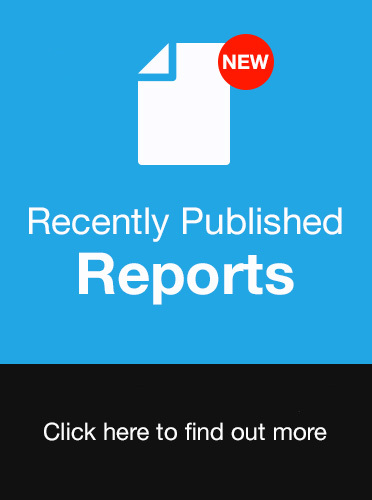 | Matthew Hopkinson - Practical advice on data optimisation and storytelling. Helping people, places and companies achieve great things. The first 12 Portas Towns – how have they changed two years on? The BBC (Radio 4, You & Yours) commissioned LDC to update analysis we did for them last year with regards key indicators on the first 12 Portas Towns. We analysed vacancy rates, openings and closures and the independent v multiple mix. 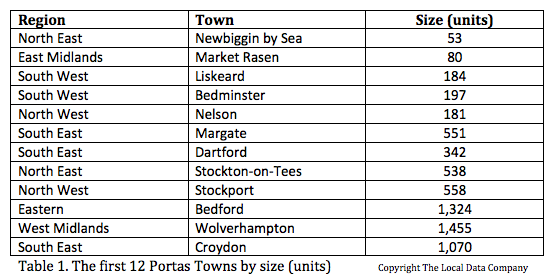 These first 12 towns were announced on 26 May 2012 by the then High Streets Minister, Grant Schapps, and were selected from 370 applications as part of the Portas Review recommendations. As one might expect the stakes were high as on announcing the winners Mr Schapps said ‘Together these pilots can be the vanguard of a high street revolution, and others can look to their example to kick start a renaissance of our town centres.’ In total the Government awarded a grant of £100,000 per pilot (total £1.2m) to achieve this. So what have the changes been and in reality what can be done with £100,000 and of course this is very different if you are in Newbiggin by the Sea or Croydon. It is also important to remember that many multiple retailers/leisure operators will spend £250,000 to £1,000,000 on a unit fitting it out which puts the grant for a Portas Pilot town in context of the wider market. One of the most visible indicators for a town are the number of empty shops they have and this is one of the KPIs that we track across hundreds of towns and as such have detailed analysis on for the first 12. 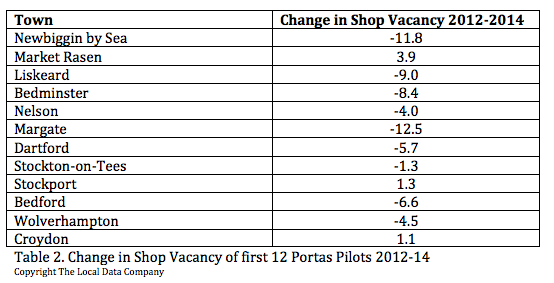 Of note is that 9 out of the 12 towns have seen a decrease in their shop vacancy rate since 2012, which ties in with the overall national rate also declining by 1.2% for the same period. 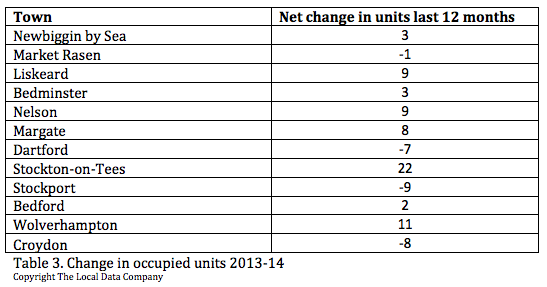 However, there are three, Market Rasen, Stockport and Croydon that have seen an increase in their shop vacancy rate. Analysis of the openings and closures shows positive change with 42 more openings than closures, which is still behind the overall loss of nearly 100 last year but again showing improvement in line with national trends. The million-dollar question of course is what type and quality of retailer is reoccupying these vacant units? Finally, of significance is the balance of multiples (chains) versus independents (less than 5 units nationally) across the 12 pilots as for the last two years we have seen a national decline in the number of units that retailers are operating from and in 2012 the decline was significant with a net loss of nearly 1,800 units! Of note here is the difference between the local, smaller centres and the large metropolitan locations with regards this balance. In terms of stability in this offer then multiples are more active than ever before in terms of relocating but also it is widely accepted that 1 in 2 independent businesses do not survive beyond their second year of trading! There are other key attributes that can be analysed within the context of occupancy and vacancy rates such as persistency of vacancy, quality of offer and retail v leisure mix but time does not allow for such a detailed analysis but it is something that we provide at the click of a mouse via our online insight system (LDO). In addition to the above facts and figures it is worth listening to the BBC Radio 4 You & Yours series of Portas town visits that Samantha Fenwick carried out last week. These can be listened to via the BBC iPlayer. In many ways this quote sums up some of the issues our town centres face and those that have stood idly by and watch it happen and then like to be seen as coming to the rescue. Mary had a very challenging task and brought some much needed attention and focus on the plight and role of our town centres and no one should have ever expected that she alone or indeed with the help of £1.2m could reverse structural change of many years that we have all observed from in our High Streets. Knowledge through data and insight needs to be the bedrock of stakeholder engagement and enable everyone at all levels to agree objectives and track performance as any commercial entity has to do to survive. This entry was posted in High Street, Independent, Retail and tagged Independents, openings and closures, Vacancy rates. Bookmark the permalink. The High Street – dead or alive? What determines the ‘health’ of a place? How many high street ministers ago was that initial announcement? Three or four? I’ve lost count. As always, top class analysis! 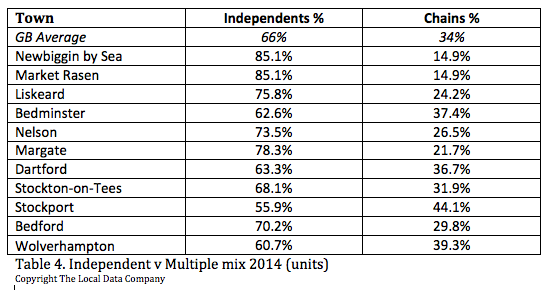 Interesting analysis but a couple of questions: do you have Croydon data on independent v multiples? also what are the change figures in this ratio?